The Petsafe 5 Meal pet feeder is one of the best automatic dish feeders with a digital timer which gives you more accuracy in feeding times. As follow you will find a full review of this automatic feeder with all the information you need to decide if this unit it is suitable to your needs. 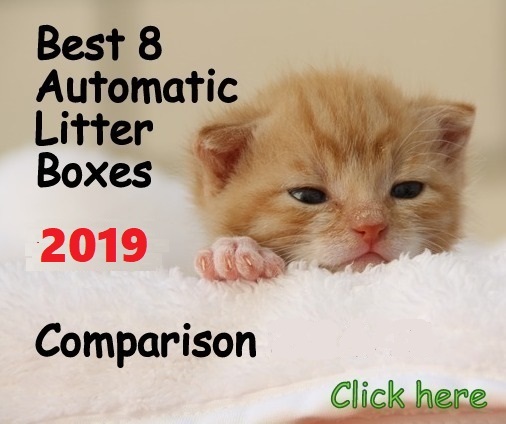 In this review, we will give you a description of this product, features, pros and cons, tips given by current customers how to better use this automatic feeder and final conclusions. 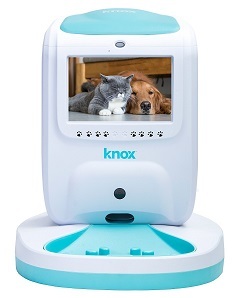 The PetSafe 5 meal pet feeder automatically feeds your pet up to 5 times a day, 4 of them are programmable meals. 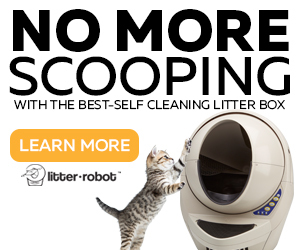 With this automatic feeder, you will not worry about your cat not eating or overeating. The digital timer allows you to set a feeding schedule with one-hour increments between each meal. For example, you can set it up to deliver equal portions 5 times a day (the first meal at present time), or one meal every day for 5 days, or 2 meals every day for 2 and a half days, and so. Automatic feeder made with rugged polypropylene. 5 compartments with a capacity of 1-cup of dry food. Very easy to program with digital timer. Removable food tray for easy cleaning. Requires 4 D-cell batteries not included. Unique dish feeder with digital timer. Very easy to program and operate. The digital timer is very accurate. Programming does not need to be restarted every day, it is one-time-thing so you can relax and forget about it unless you want to change the times or remove batteries. Deep compartments that hold 1 cup of dry food each. Made of durable and resistant materials. Sturdy so your cat cannot tip it over. It works with rechargeable batteries. The feeder has a good grip on the bottom. Batteries seem to last a long time. Good solution for overnight trips. You can easily set as many feeding times as you like and also set the feeding times at any intervals you like. The motor of the feeder makes a whirring noise when the dish rotates (it lasts 2 seconds). It’s not a cat-proof automatic feeder. Some smart cats (more chances with Oriental breeds) can figure out how to rotate the tray with the paws. You can program really 4 meals as the first one is exposed to be served at present time. Works only with batteries (customers report batteries last a long time). It does not have ON/OFF switch, so you have to remove the batteries if you want to turn it off (if using it every day no needs to turn it off). The unit does not have “low battery” indicator. Very difficult to insert and remove batteries. The unit does not retain programming after removing batteries. To use with moist food is not good for more than 24 hours as it does not have ice pack underneath the tray (it has one small compartment to put ice and it is set underneath the present feeding compartment). 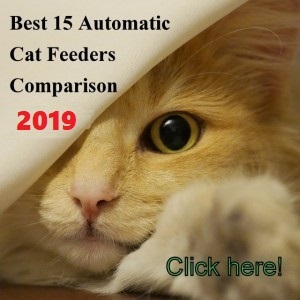 Excellent 4 tips mentioned by current customers to make of this automatic dish feeder a good experience for you and your cat. Then we will give you our final conclusions for this product. √ As all feeders, make sure to try it several times before leaving your pet alone with the feeder. This way you will make sure your cat is getting used to the motor noise that lasts approx. 2 seconds. √ Before using the Petsafe 5 meals, make sure to peel off the instructions label on the lid or tape it properly so the lid rotates without problems. If you peel off the instructions label, you can print them going through the Petsafe website. √ Make sure to push the lip down till it “clicks” so this way the tray is locked in (and not on top of) the little guide at the back edge of the base. This way your cat won’t be able to move the lid with the paw trying to get more food from the next tray. √ If the compartments ever get off from the center, there is a button that moves the motor (turns the compartments) and centers the lid again. √ Never fill the food tray in presence of your cat. It will know all the food is inside and will try to defeat the dish feeder. √ If you want to feed your cat moist food, freeze all meals for 12 hours before installing the tray into the feeder. Then for the compartments that will feed within the first 10 hours, spread the food within the tray. For the trays that will open after 10 hours leave it frozen in the shape of the can because this way takes longer to thaw. √ To avoid chin acne in your cat, you can remedy this by buying small stainless steel prep bowls (3.5” in diameter) from Sur La Table. These bowls fit perfectly into each compartment. This is an excellent product if assembling it properly, which is simple. The PetSafe 5-meal allows you to feed your cat dry and wet food (with some adjustments for wet food) and it has an affordable price. 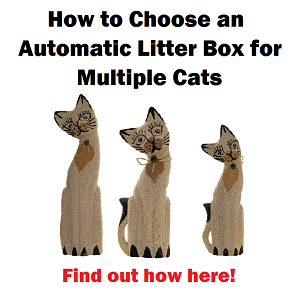 For anyone who works and needs to feed the cat multiple times a day. 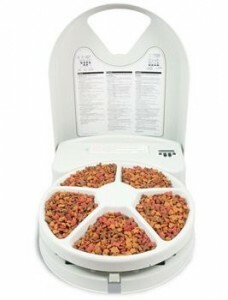 For cats that need to lose weight because it allows you to feed your pet specific portions throughout the day. To feed your cat moist food: Only if the feeding cycle length is 24 hours and if you set the food on the tray as described in #3 customers tips. If your cat is stressed or has anxiety because this feeder makes a loud motor noise when the lid is rotating. 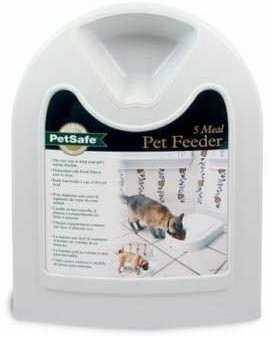 To use this feeder to feed for more than two days if you want your pet to eat 2 or 3 times a day. 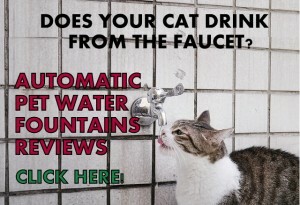 It can be used up to 5 days if the cat eats once a day dry food. To use it with moist food if you live in a hot weather. You are right John. If you use this unit for moist food, it has to be with frozen food and put them on trays with the shape of the can, so it won’t thaw. I love this feeder. It has lasted 3-4 years with no problems. I am going to have to replace it this year however because it is beginning to malfunction. I have only one cat and she only eats dry food except an occasional treat. 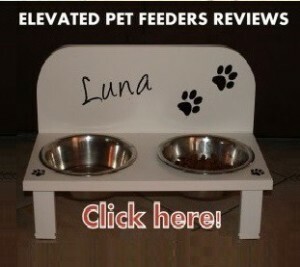 Hello Carmen, I am happy you had a great experience with this feeder and are sharing it with our readers. They will appreciate that. Thank you!! My cat is aggressive for food and has figured out how to break into the CAT MATE C50 AUTOMATIC CAT FEEDER. She gets her little paws into the next tray, pulls it over, and nibbles away. If I bought this could she do the same thing? 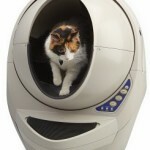 Hi Bryce, I am sorry about the bad experience with the Cat Mate C50. Regarding the Petsafe 5 Meal, I could not guarantee you that your determined girl won’t try to break into the unit, but what I can tell you is that this automatic feeder is the best rated in the category of dish-feeders and I know the mechanism is harder to defeat than other devices. If you decide to try it, my suggestion is to never put food in the feeder in front of your cat and if you are concern of your cat trying to get the food manipulating the unit with her paws, try to place the food in the 3rd tray and then the 4th so you will be able to feed your cat 2 times a day. This is an extreme solution for very smart cats. Good luck Bryce! YES, IF YOUR CAT JAILBROKE INTO THE OLD FEEDER, HE WILL MORE LIKELY BREAK INTO THIS ONE. I DIDNT FIND THIS ARTICLE BEFORE I OPENED THE TOP TO SEE IF ANY ADDL FOOD TRAYS WERE FULL IN FRONT OF MY CAT AND HE BEELINE RIGHT OVER TO IT BEFORE I CLOSED IT…AFTER THAT HE CONTINUOUSLY PUSH THE EMPTY TRAY WITH IS PAW AND ABLE TO PUSH IT ONTO THE NEXT FULL TRAY AT LEAST 1/2 EXPOSED, EATING ALL THE CONTENTS. We have had “Oscar” (our Pet Safe feeder) for two years and it works great because we have a porker kitty who eats everything in sight. Recently, it stopped opening. We changed the batteries and the clock still works so I think the motor is out. Has anyone found any troubleshooting tips? Or is our Oscar dead? We really don’t have the money for the added expense of buying another one. Hello Janet, if I were you I would not give up on Oscar. Do you know somebody that is handy at fixing electronics? maybe the unit has an easy fix and could even work with another motor. If the unit has been good for two years, it is worth it to make the effort. At glance I would say the motor has died but you never know until you open the device. I am sorry I can’t help you more. Good luck Janet! We had one for 3 or 4 years and loved it, so when the motor gave out we replaced it straight away. The new one has arrived in the post and seems to have the defective motor I’ve been reading about. The clock works but the tray doesn’t spin, even when you press the automatic advance button. We spent a lot of money to get it shipped to Australia from overseas, so we’re pretty annoyed. As the product does not work as it states it came with a factory defect and you can ask a full refund according to the product guarantee. I am sorry you got a bad unit, thanks for sharing your experience. Does the food tray remove for washing in the sink? Yes Virginia, the tray is removable. We have had this feed about three years. We LOVE it. We have a diabetic cat and we use it to give him moist food every few hours when we are away or asleep. There is a small freezer pack that fits perfectly in the compartment under the tray, but it is no longer made. Fortunately, we have several of them. We add water to the meals that will be available an hour or more later, and it keeps them palatable. My only problem is that he is losing his hearing and has been sleeping through the motor noise now. I wish it had an alarm on it! Hi Tanya, according to what you describe I conclude that the unit has reached its lifespan and it’s time to replace it. You can contact the manufacturer and ask for help. They may even replace your feeder for a better price. Hope that helps! I’ve had my unit for 3-4 years and use it whenever I need to be away for more than one day. It is a fantastic unit that is easy to set up and works flawlessly. Easy to clean and maintain. Granted it does make noise as the disc rotates, but my cats are not afraid of the sound…they use it as a single that it’s Dinner Time. I’m sure they mfgr has improved the unit since I bought mine, so when this one eventually dies, I will be purchasing another. Hi, just wondering if I set two times, lets say 8 am and 6 pm, but I leave for 2 days at 3pm and feed them. Will this feed them again at 6 or wait until 8 am to start its cycle? Hi Mark! I am not sure if I understad your question but the feeder has a digital timer with a 24hr length of programming so if you set two times a day at 8 am and 6 pm this feeding schedule will repeat every day since the timer is not a week timer. When you select each time for MEAL 1, MEAL 2, etc. if they are all within 24 hours they will be served throughout 24 hours, if you set a time for only MEAL 1, let’s say at 3 pm, this will be served every day at 3 pm in which case your cat will eat once a day for 5 days, including the opened tray. We have been using this feeder for about a week now, and I have to say that it has completely changed everything. Our porker of a cat would cry at our door all night long for us to give her a snack. We would try to put food in a puzzle feeder before bed, but she would scarf it down before we even fell asleep, and then would be back at the door at 2:30am. I was at my whits end! Introduce the 5 meal auto feeder! We put food in each compartment, and it is set to go at 10pm, 2:30am, 6am, noon, and 5pm. This way she eats more often when she is most active at night, and less when she is sleeping during the day. The only downfall to this which took me a day to figure out, you have to fill it at least 2 times a day to cover all 5 feeds since one dish is always open. 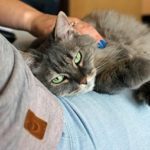 I have an 11-year old Ragdoll and although she is neither over or underweight she does not seem to have an “off switch” (i.e. the “I am full now” feeling) when she is eating and will – every so often – vomit as a result. I have tried manually feeding her extremely tiny meals (say a dozen kibbles) every hour throughout the day and then she is fine, but obviously that is incredibly labour intensive and I have to be near the bowl all the time to maintain a ready supply of them. 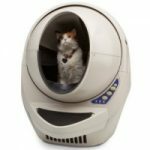 So I was looking to get this as it seems to be the only solution to giving the cat literally only a handful of kibbles every hour. I realise I will have to refill all the containers at least once or twice per day but is this workable in practice? In other words, I would want my cat to have access to each dish – every hour (or possibly two hours) – over at least 18 hours per day – so that is 9 tiny meals per day, each of equal size (since that is what works when I do it manually). I would have said 12 or even more meals per day but it looks like the timer is limited to 9. Other than that, is there some other feeder that only delivers literally a tiny handful of kibbles every hour over a 24 hour period? It seems most other models either deliver too much food at once and / or do not offer enough meals each day. At least with this rotating style of feeder, I can pre-empt the precise number of kibbles for each meal. And that amount has to be tiny – far less than any of the “chute” style feeders. As I say, my problem is not over-eating per se – it is simply eating too much at each sitting. She just doesn’t realise how much she eats then 5 minutes later goes back for even more and that is when the vomit trouble begins. I am really getting frustrated with this. Cleaning up vomit from the carpet is very time consuming and I have too many other domestic duties as it is as I have to look after absolutely everything in the house from the front gate to the back fence and everything in between!! I really need something that will stop my cat from unwittingly binging when she has no biological need to do so! And in closing this little War and Peace rant, I am really surprised that there does not seem to be any automatic feeder on the market that caters to the “grazing” style of cat – that is, the cat that eats regular tiny meals over a 24 hour period. For grazing cats, 10 or more meals a day is perfectly normal. Hello Jonathan, thanks for sharing your thoughts on my website about your problem with your cat. 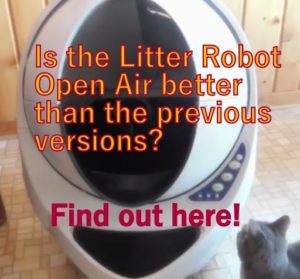 I understand what you mean, when it comes to automatic pet feeders with chute, you won’t be able to feed your cat the exact number of kibbles each each meal because it isn’t technically possible. But the solution you found is the correct one in the sense that dish type feeders allow you to put the exact amount of kibbles in each tray. Maybe you need a dish type feeder that is able to dispense as many meals as you want within 24 hours and you can program and control remotely. The Feed and Go automatic pet feeder has the same concept of the Petsafe 5-meal but you can program it to feed numerous times a day. The downfall is that this unit is a little pricey. If you want you can check a full review I made of this automatic feeder here. Hope that helps! We have used this product for a year and we really liked it. We just bought a second one for our other home. However out of the box I can not get it to function correctly. It doesn’t rotate enough for the compartments to be centered in the opening. Even when I push the manual rotate button It only rotates half the amount it should. Any suggestions? If the unit isn’t working properly out of the box, you are covered by a limited guarantee. Call customer service and ask to get that unit replaced. My Five Meal feeder is 15 months old and it has stopped rotating. Any suggestions anyone? I purchased 2 feeders about a month ago….1 for each of my 2 cats. They were both working fine, but I have noticed that one of the feeders has suddenly stopped rotating, and the compartments are not lining up with the opening properly (slightly off center). Is there a way to ‘reset’ this? I think one of my cats might have been playing with the feeding compartments, that might have caused it to go off center. Thanks. Hi Cinde, you may want to call the Company for replacement. If you have the unit for a month and stopped working you need to use the Warranty. Thank you Lorena. I will call them.